The following images are of a gun which, according to the plaque on the gun, was taken from the wreckage of the Spanish Cruiser VIZCAYA. 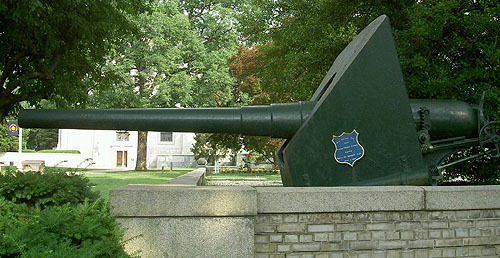 The gun is located on the campus of the U.S. Naval Academy at Annapolis, Maryland, at the corner of the Commandant's yard. The VIZCAYA was destroyed at the Battle of Santiago. The gun is one of the ten Hontoria 14 centimeter guns carried by the ship. 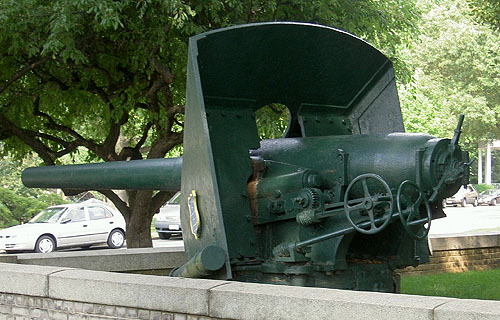 This is an image of the gun as seen from the side. The plaque mounted on the side of the shield identifies the gun's origin. The gun as seen from the rear. Sumrall, Al, correspondence with editor.